Imagine two professional social media users, sitting on the opposite sides of the table with their laptops on – we’ll call them User A and User B. Both Users have 100 different content pieces (photos, blog posts, videos, gifs), polished and ready to be posted on various social media channels. User B decided to post his content manually or “the old-school way”. He wants to make sure that everything looks nice and doesn’t care how much time and effort it will take him to post everything (plus, to follow, analyse, respond to reactions, etc). He trusts himself and no one else! Alright, no judging. User A, on the other side, is willing to test the automatization tools or “the twenty-first century way”. He thinks ahead, knowing that the less time he wastes on posting, the more he’ll have for analysing the results, planning and improving on his strategy. He knows that social media is no child’s game and if done right, it can bring truly profitable results. So, which social media posting is better – “old school” or “21st century”? Needless to say, by the time User B just opened up all of his social media accounts and entered login information for each and every one of them, User A already posted 20% of his posts, which are also intelligently distributed to go live in different times, for days to come. The secret weapon User A used is simply called a social media management tool or system and yes, using the right one can make your life much easier. Whether you’re a blogger, marketer, business owner, a marketing or a PR agency, a management tool such as Buffer, HootSuite, MeetEdgar, SproutSocial or Amplifr, can immensely help you in your social media endeavours. In essence, these platforms allow you to manage various social channels from a single dashboard. Posting on social media in this way, with scheduling and optimizing features, not only saves your time, but also increases your potential outcome (and income) online. If you wish to grow your own or your client’s business using social media channels, we might have a solution for you. Focused on scheduling, collaboration and deep analytics, Amplifr is the most user-friendly and insightful social media management tool. It is made to bring clarity, ultimate control and profitability to your social media endeavours, no matter the size of your audience. Scheduling features in particular save a lot of precious time. Amplifr even posts and re-posts your content automatically – all you need is to upload the content and the system schedules it on its own. Well, using its unique features, such as perfect posting time suggestions and conversion-based analytics, Amplifr basically helps you elevate your business in various ways, through your social media channels. To be honest, we became tired of analytics that only track likes, views, comments and shares, without using the full potentials of social media marketing. Knowing that social media is much more than a popularity realm, we invested years in building deeper, more profit-focused analytics, that actually show where the potential leads and sales are hiding. This way, you can truly leverage your social media strategy – likes do not bring sales, but conversions do. Amplifr is a powerful tool, created to make social media management – which consists out of scheduling, organising, collaborating and analysing – as straightforward, understandable and easier as possible! And much more (with more to come as well, we are continuously expanding our offer). With this social media management tool, you can either manually schedule your updates or put them into Sprout Queue with sharing schedules you set up in advance. But, once the posts are shared, your schedule clears out and you need to rewrite and reschedule the posts again. Analytics – Sprout compares your Twitter accounts, Facebook engagements etc. Amplifr vs SproutSocial: which one should you choose? SproutSocial is indeed a seamlessly organized, beautiful platform, full of shiny features. And in order to enjoy this, the price you’ll have to pay is rather high comparatively to other similar services. (99$ a month per only one user or 500$ per month for their Team version). But here at Amplifr, we believe that user experience is everything. And that includes the effort to keep a high-level service, without overburdening our customers’ wallets. Next, we do agree that Sprout’s interface looks great, but having all the streams blended into one unified platform, can be unpractical, even overwhelming. 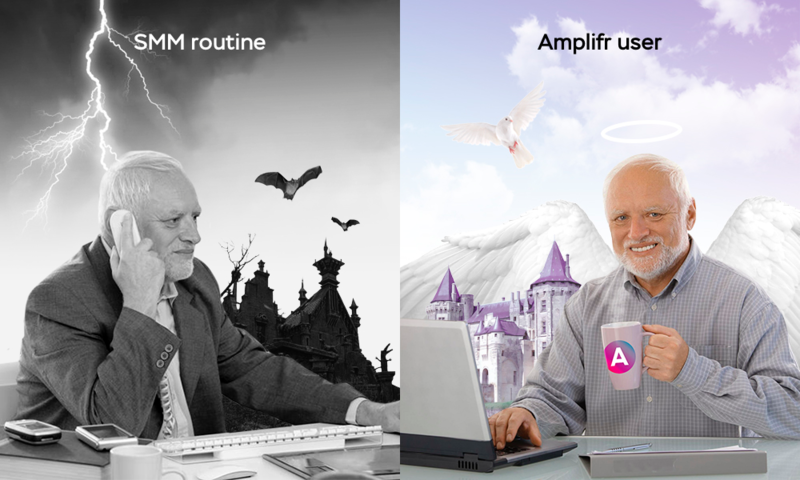 Amplifr is a clear, well-organized platform, which can be successfully used both by complete beginners and experienced users. It also provides deeper analytics than Sprout, focusing on potentially money-making stats, such as conversion and traffic data. Also, Amplifr covers over 10 social media channels, while Sprout only supports five, without an option of posting to groups. While the team of SproutSocial worked mostly on design and various engagement analytics (which is admirable, undoubtedly), we were more focused on conversion analytics that can bring you insights that will result in more leads and sales for your business. SproutSocial is a great tool for users with high marketing budgets and high aesthetic requirements. It does bring a lot of handy features into social media management, but it’s still mainly focused on visibility and popularity (as most of the other SMM tools out there). Amplifr is definitely a tool of choice for any business manager, that sees beyond likes, comments, shares and clicks, and wants to reap the true benefits of a successful social media strategy. Want to be more visible and profitable with social media? Enjoy Amplifr.